Rise and shine, my little masterminds! Another Wednesday means it's time for another Weekday Escape, and that means it's time to party the way we like it... with inexplicable incarceration, improbable situations, and a whole lot of puzzles! This week! MayMay wants you to lend a fin and that's no fluke, which sounds sort of fishy to me. no1game gives you a theme park attraction for couples a little more engaging than sitting in the dark and trying not to imagine what happened last on that ride seat. And Esklavos proves no good deed goes unpunished, and least not when it comes to brandishing tools at stranded motorists! 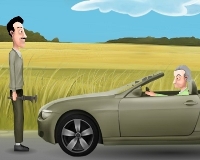 The Irritatis: The Road - Stop to do a good deed, inadvertently terrorize a stranded motorist... hey, we've all been there, am I right? Esklavos' Angelo Irritati has pulled over to indulge in a little postive-karma car repair, and I have to say, I don't know that I blame someone for being a little leery of homebrew engine coolant, especially when its ingredients include whiskey and goose droppings. But hey, maybe things will turn out alright if you help Angelo get everything together so they can all be on their way? Find the Escape-Men 166: The Escape Mansion - Most amusement park rides aimed at couples are kind of lame, but no1game knows what's up, and you and your boyfriend have to split up to solve the riddles of this theme park mansion together... for two endings, no less! As you might expect, you'll need to find the ten little green men hidden throughout the place to get out, or you can use the phone to quit... ha! Clearly they don't know who they're dealing with! 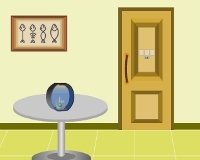 Catch the Fishes - There's something fishy about this cute little escape game by MayMay, but don't worry... no concrete shoes or gangster slang is involved. Instead, you've got a whole lot of codes, and a handful of scales, too, because to get out, you're going to need the help of a fine finn'd friend. Weekday Escape N°95 Walkthrough now available! Pick up the rock from the bottom middle and the cloth from the bottom right corner. Click your car to look in the trunk. Get the "soundbox" from on top of the boxes on the left, the blank sheet from the bottom box on the left, the cleaner from the back right, and the batteries from the front right. Note the coolant recipe taped to the back of the seat: whiskey, goose droppings, ethylene glycol, and guanaco spit. Turn back to the other car. Use the cleaner and the old cloth to clean the windshield. Pick up the coin the driver throws at you. Take a look at the soundbox. Use the coin to open the battery cover and put in the batteries. Use the soundbox to call a guanaco (the llama-looking animal on the right of the dial). Next, use the box to call a cat, then immediately use it to make the guanaco attack. Pick up the spit from the windshield and the card from the ground. Look at the card; note the pattern of dots. Look behind the driver at the hatbox-looking thing; set the dots in the pattern you saw. Get the bottle of whiskey. Use the soundbox to call a goose, then make it attack. Get the phone. Use the soundbox to make the goose relax. Pick up the, uh, result using the blank sheet of paper. Look at the piece of paper on the ground between the two cars; note the phone number. Dial that number on the phone. Throw the stone (remember the stone?) at the drone. Get the ethylene glycol. Turn back to your car trunk and put all the ingredients into the coolant container ("jerry can") on the left. Get the container. Turn to the other car. Use the old cloth to open the hood, then pour in the "coolant" you concocted. Get the note from between the books on the bookshelf. Turn it over. Open the window. Click the question mark on the phone in your inventory and click the camera icon. Wait until the roller coaster comes by, then quickly take a picture with the camera. (If you don't succeed, just wait a bit more; the roller coaster will come back around and you can try again.) Get the green guy from the picture. Look at the safe on the wall. Note that only boxes 5 and 6 are clickable. The boxes are A, zero, one, O, zero, zero, Z, two, six. O is the 15th letter of the alphabet, so set box 5 to one, and box 6 to five. Get the mallet and the splatty green man. Get the escape-man cookie cutter from the right side of the bookshelf. Get the paper clay and the clone stamp from the 6-door cabinet. Open the papier mache, then use the cookie cutter on it. Use the clone stamp on the splatty green man, then on the papier mache one until the latter is completely green. Use the mallet on the back of the safe. Throw the extremely thick green guy at the ceiling fan (window view) to get two, count 'em, two escape men. Count the books on the bookshelf. 4 red, 2 black, 1 yellow, 3 blue. Use the mallet to remove the colored disks in the order given by the books. Get the little key from the six-door cabinet. Look at the mallet using the question mark and turn it so you see the little door. Use the little key on the little door. Get the stick from the bottom of the bookshelf. After using the fan to slice the thick escape man in half, pull the cord that drops down. Use the stick to dislodge the green guy. Turn to the door view to pick him up. Note that the clock consists of 4 sets of 2x3 panels. Click the doors of the 2x3 cabinet in the order given. Collect all 10 escape men, then use the resulting key to open the front door. I have seven escape men. I've found and used all the items except whatever goes next to the "thick escape man". I can see an escape man on the fan, but can't reach him. I have no idea what the clock means. I found the pole and turned the note over. Nine escape men. Still can't figure out the clock. I think it's something to do with it being almost symmetrical, and I should turn the 7 into a 1, but I can't see how. Or maybe I'm on the wrong track entirely. Don't just look at the numbers, but the background they're on as well. The gray boxes, specifically. Have you seen gray boxes anywhere else? 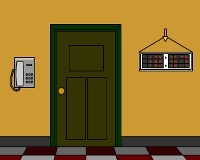 Click the doors in the order dictated by the clock: top right, middle right, bottom right for 1, etc. Completely wrong about the clock! Ummmmm, I've somehow got 11 escape men and now I can't get out! (Box is blank white when I open the escape men box). Well I have nine men and can go no farther. All my inventory blocks are grayed out except for the note and my nine men. yes I found the man on the reverse of the note. Can not figure out the stack of blocks. 1 yellow, 2 black, etc. OK I find the Fish hard to solve. I found a lot of inventory, thanks to forcing things open, but nothing seems to 'tie' together. I used the card to solve the puzzle of the 16 pins to open the box in the back seat. Slept on it and all became clear. Any psychologists or neuroscientists among us that can explain the Power of Posting? In order to ask for help, you formulate the problem in an organized manner in front of you / in your mind, which makes it easier to see the solution. Many programmers actually use a similar technique to debug faulty code, explaining it to an imaginary observer in order to figure out what they're doing wrong. It's sometimes called "rubber duck debugging" because a rubber duck often plays the role of said observer. put the batteries in the box and called a goose and a guanaco. I can get a rise out of the stranded motorist, but he just sits back down. Obviously, I am missing a key piece or observation, which will enable the game to go forward. I rage-quit last night, and I'm close to shutting down and going to bed. Use the soundbox to get the goose to attack the driver; this drives up his irritation level and causes him to drop something (I forget what). When you next get stuck, use the soundbox set to cat or dog to get the driver to rise up, then quickly use the soundbox to get the guanaco to attack. This will get you a couple more items.